I came across this Window Farming site which promotes growing some of your food on your home/apartment windows if it gets enough sunlight. My gardening interests have grown dormant and my mini-produce plot has grown brown because of a couple of reasons like being away too long, extremities injury, etc. The most notable reason is still that nobody will water the plants when me and the wife are away. 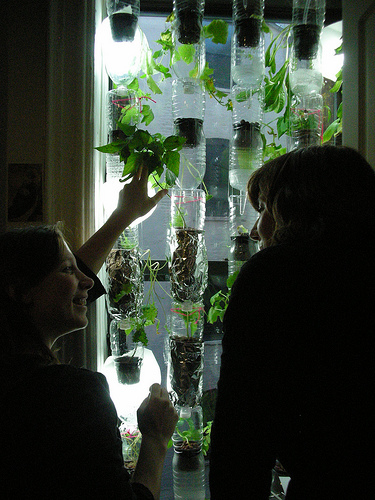 The Window farm is a hydrophonic variant of home gardening and it uses an ordinary water pump (like the ones used in aquariums) to pump the nutrient-rich water into the recycled water-bottles that have been re-purposed as hanging pots. The pump makes sure the owners don’t forget to water the plants but that still means there is an electricity cost involved. I am thinking that coupling the pump with a solar panel would negate the electricity cost if there is ample sunlight and space. I haven’t gone through the manuals yet but in case the hydrophonic plants require 24×7 water flow then it might be a workable compromise to have the water pump working in the day and then adding some water retentive materials in the bottle-pot (e.g. coconut husk threads or rice husks if available) so that the plants would still have some accessible water at night.